Advertising. Dance. Londoner. Mummy. Scribbler. Talent. Wife. In alphabetical order. The Witch Doctor and the Abang Tesco. As I wrote before, my recovery has been a long and arduous one and I’m not even sure if I can even refer to it as my ‘recovery’ seeing as I’ve not actually recovered yet. But I guess I shouldn’t dismiss the fact that I have made lots of progress though…(wouldn’t want God to take away my blessings!). Today is Day 51 since I gave birth but for the last couple of days I’ve been relegated back to my bed. Perhaps the overexcitement on Saturday triggered the pains but whatever it is I am so tired of it. I’m not used to having to move so slowly and carefully, not being able to bend down to pick up things and just not being able to do much of anything. For someone who is independent and a firm believer in the saying, “If you want something done right, then do it yourself”, to have to be so dependent on others for the last 50 days has been torture for me. I saw a couple of different medical doctors and they all said that I’m healing well and in fact I should push myself to do things like walk a lot, carry the baby and go up and down the stairs. But when I told my mum, my helper Celia and Kak Ita (my pantang lady) what the doctors had suggested, you would have thought I said I was going bungee jumping with the baby! With so many conflicting advice and opinions, I was am quite confused but what is certain is the pain I still feel. One doctor even told me that it might be psychological but how could I be imagining something that is so real and so…physically present? I guess we will only know whether this works or not once I start drinking the water from the healer. Whatever it is, my niat or intention will always be for God to heal me and that it is all in His hands. Just that maybe this is one of the avenues I should try in order to receive God’s help. If we don’t try we’ll never know. So seeing as I’m still housebound and hubby is busy at work (not to mention exhausted too) I decided to try and shop for groceries online with Tesco.com.my until I feel well enough to go to the supermarket. For the past month and a half, my lovely dad has been doing all our shopping, choosing all the meat and veg himself (aww!) and delivering it to our flat for free! We’re so lucky, but it’s about time we stopped using AbahDoesOurShopping.com and started doing things on our own again. Tesco online is sooo convenient and after a hilarious lesson with Celia (she taught me what runner beans, French beans, ginger, bitter gourd and pak choy looked like online) I clicked ‘confirm’ and the groceries were scheduled to arrive the next morning. Oh my god. This Abang thinks Celia is my mum and Aidan is my little brother?! Abang Tesco: Ni ha…kita ada promotion patung Marvel- ni Kakak dapat 3 sticker, kalau kumpul semua boleh lah dapat patung mainan untuk Adik comel ni! Abang Tesco: La..ni anak Puan ke? 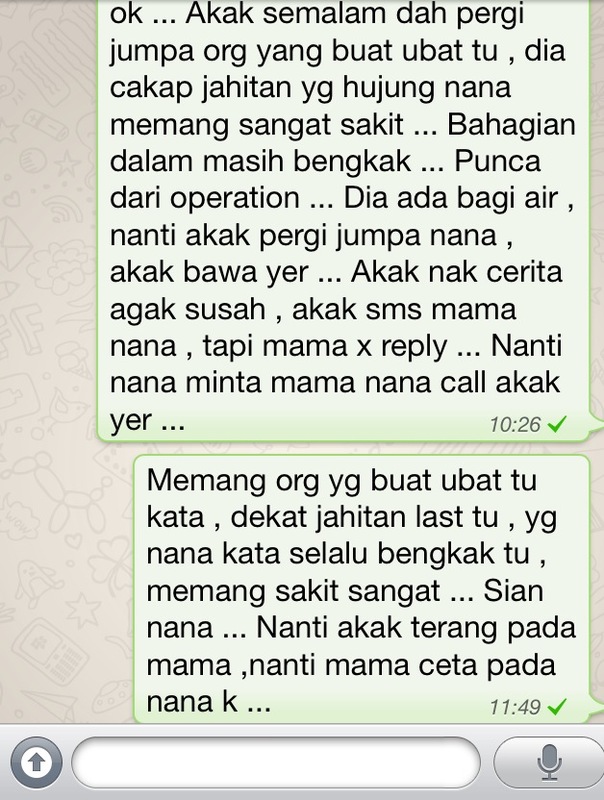 Maaf lah, saya betul betul ingat Adik tadi…Maaf ye Puan.. So I don’t know whether to be offended or not but I’ve decided to take it as a compliment because he was so sweet and sincere. If only I had captured his face when he realised Aidan was my son…that would have been priceless! 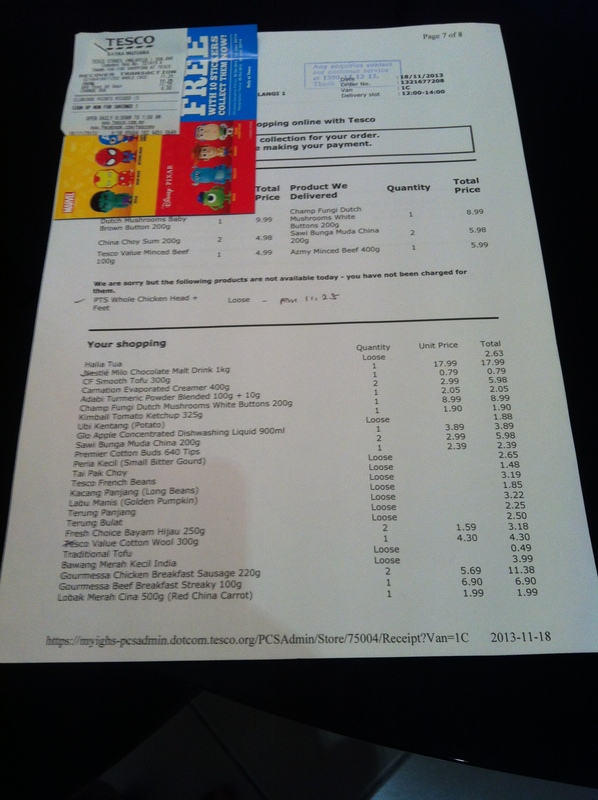 I bought 35 items for RM156! What a bargain compared to when we go to the actual supermarket because we always end up with junk we don’t need for the same amount of money! And when I ‘cook’ (i.e. buy jars of things and mix them together), one meal alone costs over 100 bucks! Sigh…I’ve got a lot to learn from Celia. This entry was posted in Being a mum, Controversial, Family, God, Hubby, WollyLife and tagged Caesarean, Delivery, Diyana Abbas, Doctors, God, Healer, Malaysia, Pain, Religion, spiritual, Tesco by diyanaabbas. Bookmark the permalink.